On many European vehicles, the reverse or back up light housing is quite small and does not produce much light to begin with so it makes it very difficult for you to see or others to notice you while you back up your vehicle. Due to the smaller housing size, larger and brighter bulbs are not able to fit so we are left with minimal options to get a super bright light. 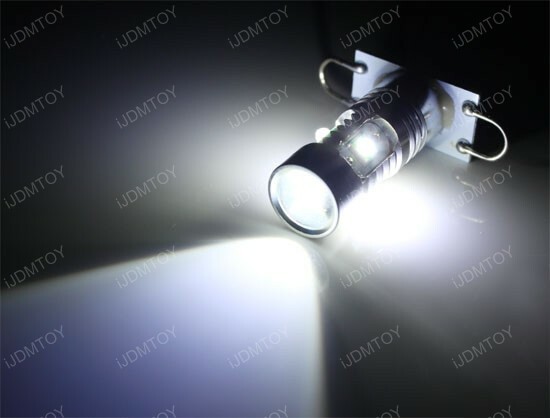 This is where using high power CREE LED diodes come in handy; these lights provide a large amount of light output for their small size. 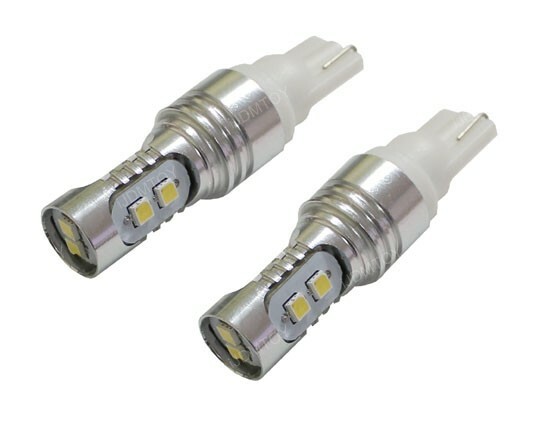 Each bulb for this E92 LCI LED backup lights utilizes five CREE R4 XP-E diodes to produce approximately 500 lumen. 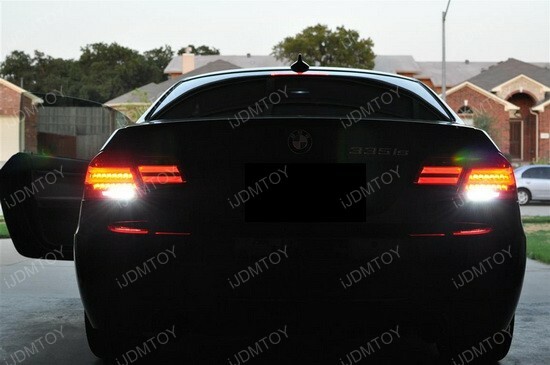 The top portion uses an optical lens projector to throw out light behind the vehicle as well to increase the effectiveness. 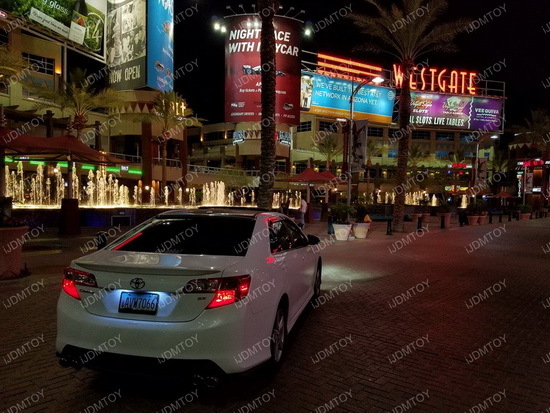 Each bulb has a maximum operating output of 25W and is 100% error free so there are no annoying error messages or flickering issues. Thanks to these features, the lights are about five times brighter than stock and about two times brighter than the competitors LED bulb. Installation is also quite easy as it is plug and play. No modifications are required for installation. The factory bulb uses a very unique mounting bracket to hold the bulb in place and our LED bulb replaces the whole entire assembly instead. 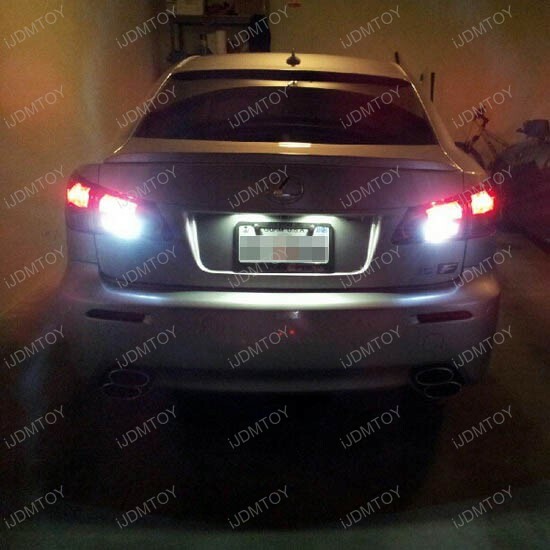 Thanks to the careful design of the lights, they have no issues with fitment and can be easily removed if desired at any time. 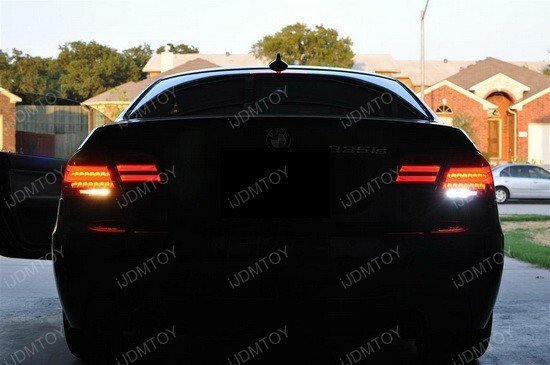 This unique type of bulb design is only used on the 2011 and up BMW E92/93 3-Series Coupe/Convertible for the reverse lights; make sure you check out our installation guide to see the proper way to install these E92 LCI LED Reverse Lights. 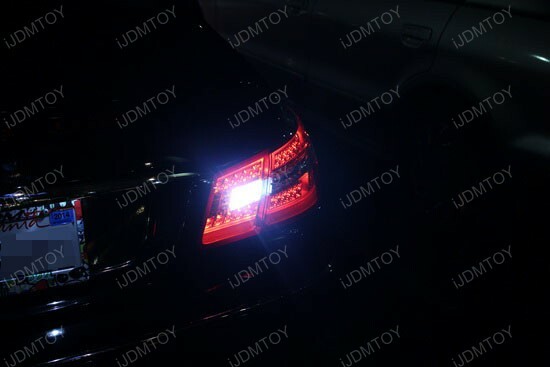 On the tail lights of many European vehicles, the reverse light bulb is very small and is a tiny slit of clear lens surrounded by a sea of red. Many European vehicles follow this style of light and it’s only natural that the 2010 Mercedes-Benz E350 Coupe would also have this style. 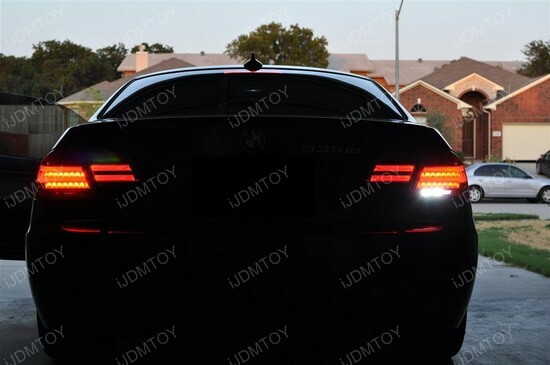 Aesthetically, this is very ideal as it is subtle and maintains the overall red appearance of the tail lights, but since the housing is so small, the light output is dim. This is why a high powered LED bulb would be ideal for these types of housings. 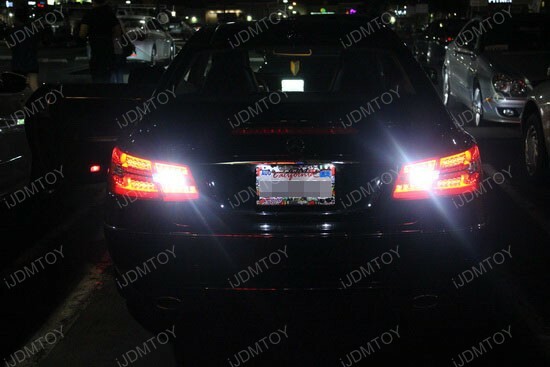 These Mercedes E350 LED reverse lights are rated at 25w and produce approximately 500 lumen for superior visibility. 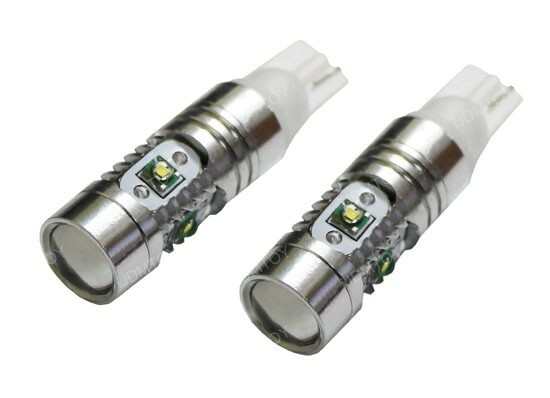 Each T15 (921) bulb uses five CREE XP-E R4 LED diodes; four on the side and one on top with a 3x optical lens for projection purposes. Thanks to its design, it is able to provide a 360 degree shine coverage of light while producing light projection making this ideal for this small housing. Larger housings may benefit from a flood type light, but these small reverse light housings do not need that. However, having all that power in a small housing that focuses the light creates an intense shine. 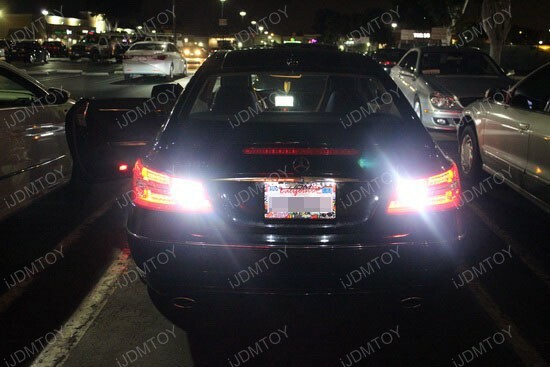 In addition to its bright light output, these LED bulbs are error free for most of the Mercedes-Benz vehicles available. 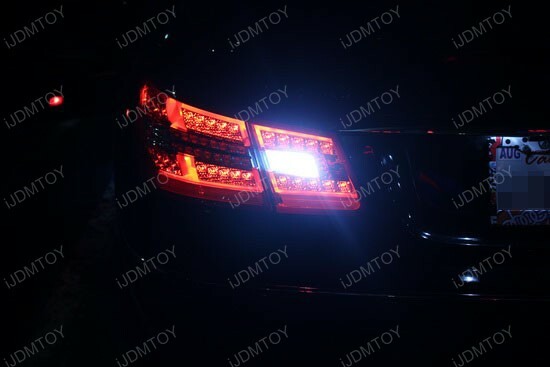 These error free 921 LED for Mercedes are easy to install and requires no wiring to work; simply swap your factory bulb with these and you’re done. 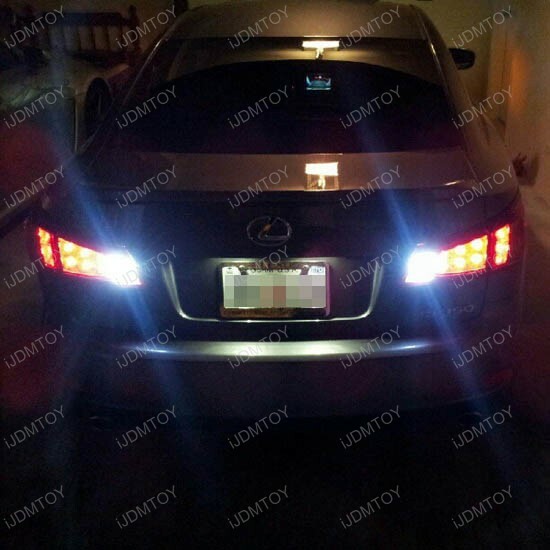 These 25W CREE LED bulbs are completely error free on the newer E-Class, M-Class, CLS-Class models and alike for the reverse back up lights.